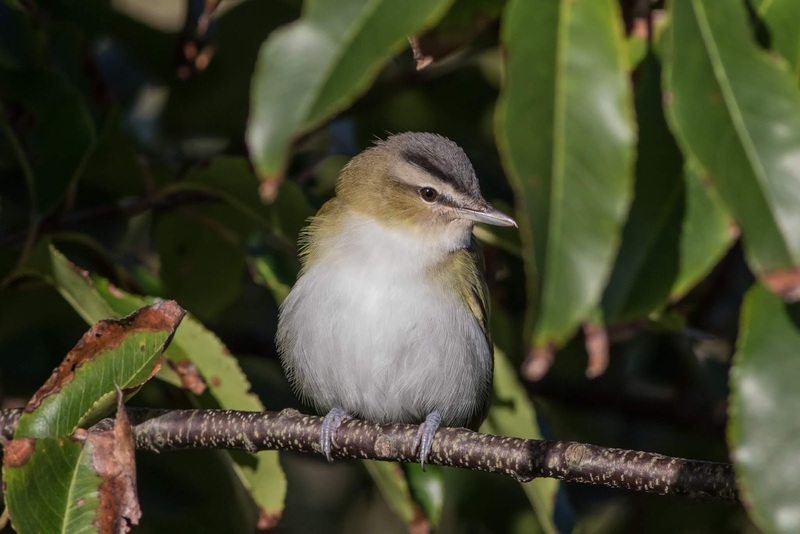 Red-eyed Vireo - Cape May Point State Park, NJ. October 13th, 2018. Image appears courtesy of John Watts. The day began cool with strong North-westerly winds. The pre-dawn air above the motel was filled with the sounds of passing migrants including the identifiable flight calls of Swainson's Thrush, Blackpoll and Cape May Warblers. At 06:45 hours we headed for Higbee Beach once more finding Brown Creeper, Golden-crowned Kinglets, Yellow-rumped and Blackpoll Warblers as we parked the vehicle. From then on we enjoyed a strong flight of migrants over the Higbee Bech dike before showers forced us back down the banking at 08:00 hours. Even so, it was clear that many birds were on the move and with the help of the resident CMBO Morning Flight counter Andrew Dreelin, we enjoyed some great views of fast moving migrants passing north over and along Higbee dike; Northern Flicker (mobs! ), Yellow-bellied Sapsucker, Brown Creeper (4), American Redstart, Northern Parula, Ruby-crowned and Golden-crowned Kinglets, Red-eyed Vireo, Yellow-rumped, Cape May, Blackpoll, Magnolia, Black-throated Blue and Black-and-white Warblers, an impressive flight of Purple Finches and a few Pine Siskins. As if the that wasn't enough, the walk back to the vehicle was neatly interrupted by a nice show of sparrows in the phragmites with Lincoln's, Swamp, Song and White-throated Sparrows all giving fine views along with a Blue-headed Vireo and a Cape May Warbler. Northern Flicker - Cape May Point State Park, NJ. October 13th, 2018. Cape May Warbler - Higbee Beach dike, Cape May Island, NJ. October 13th, 2018. We headed north for brunch in Avalon and then settled in for a seawatch at the CMBO Avalon Seawatch hut. We'd only just arrived when a Yellow-billed Cuckoo came flopping over the dunes, flew between us and headed into town. Apparently the same bird had come in off the sea and tried to settle inside the seawatching hut! Amazingly, we went on to witness a further four Yellow-billed Cuckoos coming in off the sea flying west and north-west trying to make landfall. I say "trying" because a couple certainly didn't make it. The local Great Black-backed Gulls made easy work of picking them off over the ocean - I can only imagine how many actually perished. Beyond the cuckoos we had a fairly steady seawatch but had some nice flights of scoters, a few Greater Scaup and even a few flocks of Wood Ducks moving south over the ocean. The big migrant of the afternoon was Double-crested Cormorant with about 1500 passing south during the three or so hours that we spent there. Double-crested Cormorants - Avalon Seawatch, Cape May Co., NJ. October 13th, 2018. Great Blue Herons - Avalon Seawatch, Cape May Co., NJ. October 13th, 2018. Wood Ducks - Avalon Seawatch, Cape May Co., NJ. October 13th, 2018. Common Loon - Avalon Seawatch, Cape May Co., NJ. October 13th, 2018. Caspian Tern - Avalon Seawatch, Cape May Co., NJ. October 13th, 2018. Returning to Cape May Island, we headed for the hawkwatch once more and weren't disappointed with a good showing of Broad-winged Hawk including several small kettles, and nice looks at 'tundra' Peregrine. Small falcons were notably fewer, perhaps not surprising, after the previous day's huge passage. Passerines showing well close to the hawkwatch in the late afternoon sunshine included Yellow-billed Cuckoo, Red-eyed Vireo, Nashville Warbler, Northern Parula, White-crowned and Field Sparrows. We spent the remainder of our time watching swallows over the dunes and bunker pond, and although it took a little while, we eventually got all of our party onto a late Purple Martin and a couple of Barn Swallows to round off another terrific day. Bald Eagle - Cape May Point State Park, NJ. October 13th, 2018. Purple Martin (with Tree Swallow) - Cape May Point State Park, NJ. October 13th, 2018. Nashville Warbler - Cape May Point State Park, NJ. October 13th, 2018. Field Sparrow - Cape May Point State Park, NJ. October 13th, 2018. MA - Red-throated Loons (4) in Turner's Falls.